With a tapered grip shape (patent pend.) which features more damping in the outer area of the grip and a slim inner diameter, Ergon is making waves on the DH scene with their new GD1 Factory Grip. 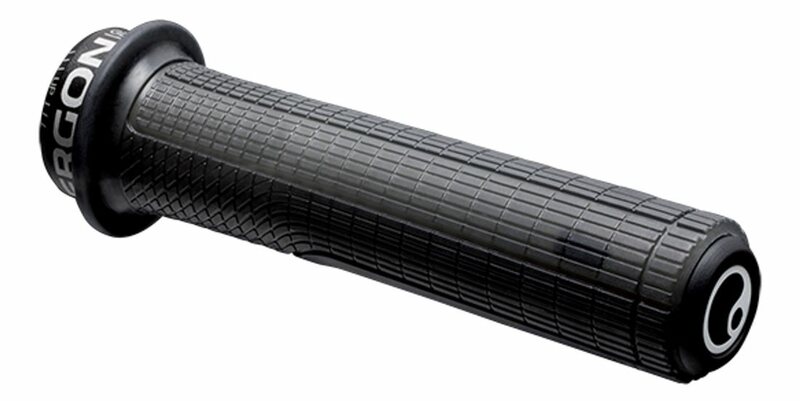 The unique rubber compound, which is manufactured in Germany, offers adhesive and rebound properties which have never been seen before in a bicycle grip. The grip feels supple and soft, but still very defined and precise. The surface profile provides the hands with optimal grip and reduced gripping force. The slim inner stop additionally improves fast positioning of the hand, to keep up with your reflexes. The high-strength aluminum inner clamp keeps the grip from twisting or shifting, even on carbon handlebars. With an inner-diameter of 30mm and outer-diameter of 32mm, the GD1 Factory has, in comparison to the GD1 Slim Factory, more damping characteristics and is recommended for riders with glove size L/XL (8,5 - 10,5) or riders who prefer a normal grip thickness. After reading some EWS Pro bike reviews... I wanted to try these out. Definitely my new favorite! Put them on, went on some long rides, and basically forgot about them. The taper shape works great to relieve pressure on the hands, and the grips are the right size and width to always feels in control. They feel secure, grippy and have noticably helped with hand and arm fatigue. I wish they had a hard built in end-cap like the ODI AG signature grips, but other than that, they are forgettable in a GOOD way. Got the grips to help my wrist pain, because the taper effectively increase backsweep. After putting them on my wrists immediately felt better, and now the issue is totally gone. The rubber is fairly soft, grippy, and tough vs. impacts, but it will develop some surface wear from your hands. There's some slight wear to mine after a couple months of use. I'll be getting GD1s again when my first pair bite the dust. P.S. I always wear gloves. Probably the best grips I have ever owned. I have medium to large hands and they feel great. I've been wanting to try these as I have been running Ergon GE1 grips for a long time. Ergon just works great for my carbon bar. The fit was relatively tight just to slide them on with the locking bolt back out. I consider this a positive point. These have end plus which is different than GE1. There is a very nice touch to the GD1 - There is a flange on the ends where the plugs go in. I see this as additional protection for carbon bars and it assures the grips are positioned full. They feel great and are "beefy" which is what I like. Vibration damping is great. No guess where you hands are with these when it gets rough. Will purchase again. Awesome grips. Helped relieve hand numbness on longer rides. Love the tapered profile it really locks your hands in and prevents slips. I bought these to replace the stock grips that came on my bike build and am not disappointed! I have my bars at 760mm and these are canted perfectly to keep my arm and wrist aligned and the blood flowing. On the downhill I'm never questioning the hold i have on my grips. They're soft enough to dampen a lot of the impacts but stiff enough where it doesn't feel like you can twist them or slide off. Super grippy both with and without gloves. I like the DH feel it gives my trail bike. What are the length of these grips? BEST ANSWER: The overall length of the grip including the end plug is 144mm, the usable area is around 120mm. They offer two sizes. What size is this? BEST ANSWER: These are the standard size of 32mm at the thickest and 30.5 mm at its thinnest. Search the Ergon GD1 slim for the smaller one.